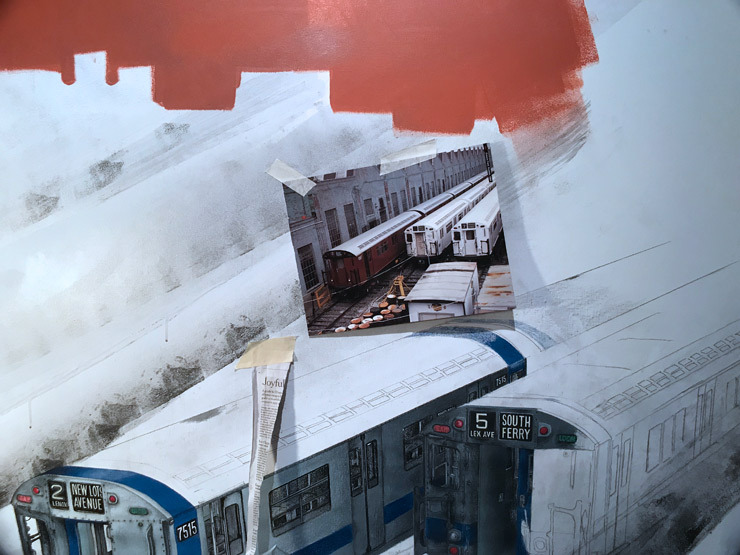 An NYC original whole-car graffiti writer and painter in the 1970s/80s, Mr. Quiñones is now prepping for his latest gallery show, a solo at Charlie James Gallery in LA’s Chinatown. 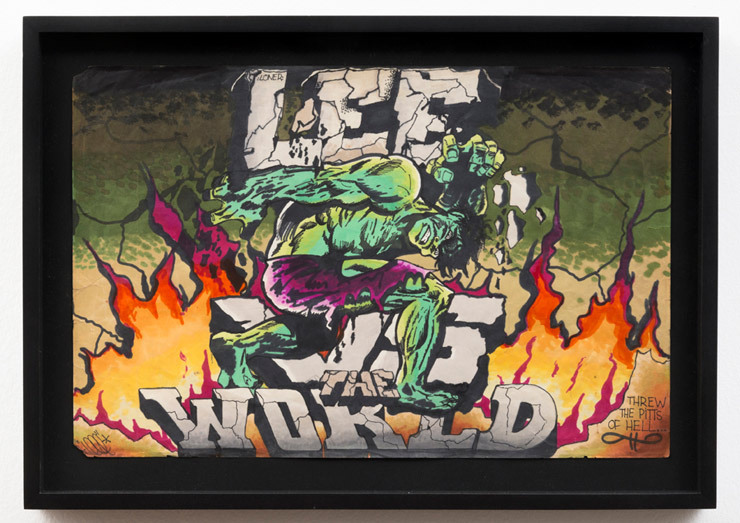 40 years after his first gallery show in Rome that many point to as groundbreaking for graffiti writers transitioning to contemporary art, Lee is easily time-travelling to those days while he is working on new canvasses that invariably include imagery from that era, even as his own style has continued to evolve and he has greatly expanded his visual repertoire. 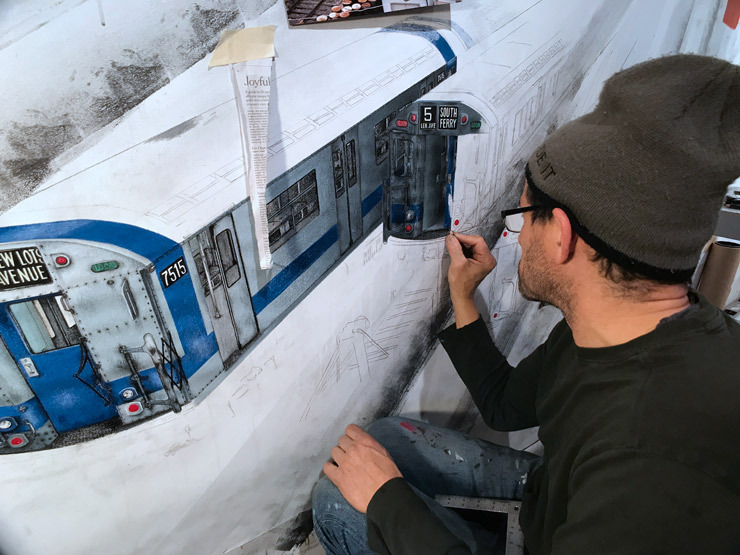 Here in his Bushwick studio his focus gathers around his penciled paint strokes as he builds up the exterior of a train racing across canvas that will be called “Born From Many Apples”. 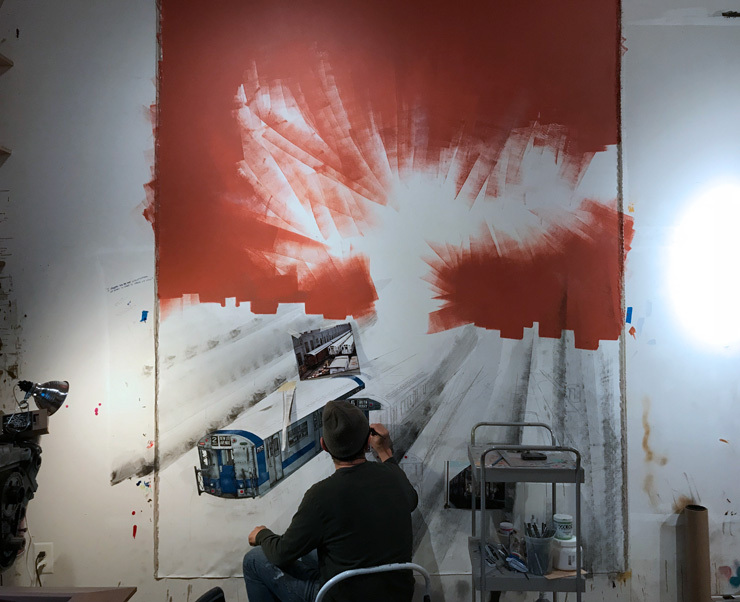 “It all goes back to the old saying, ‘The apple doesn’t fall far from the tree’ and I always remember that,” he says about a socially connected, universalist philosophy that has often appeared thematically in his work. “Born from many apples. We are part of all these things and people”. “It was a pretty special time and place,” he says of train writing in the late 70s, “Obviously all good things come to an end, so I’m okay with that.” Not romantic about the conditions of the city during those years, he’s clear about the raw nature of painting and looking for adventure on train tracks in the terra incognita of a declining New York. 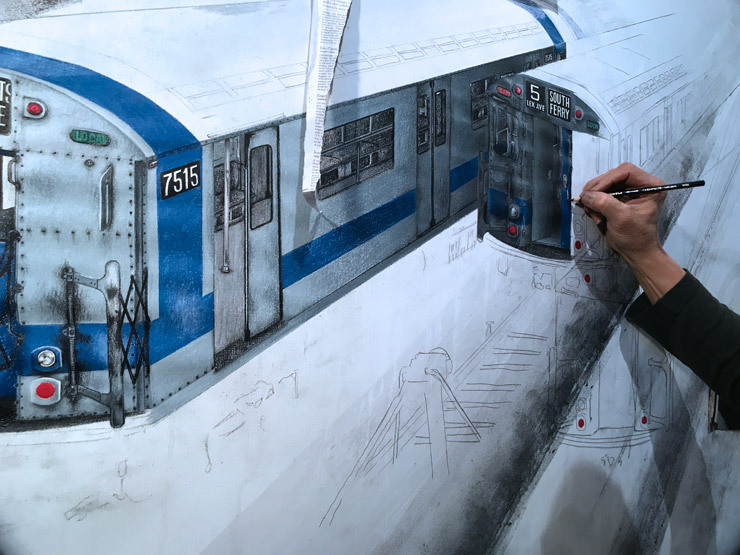 Growing up on the Lower East Side of Manhattan and studying the train lines for the best exposure for his rolling canvasses, Lee hustled for the opportunity to go large scale, to be “All City”, often drawing his trains in detail on paper before grabbing paint and staking out a spot. From the start, he took his craft seriously. Competition and verbal lore were part the game of course, but writers also shared their techniques and improved skills with each other, he says. 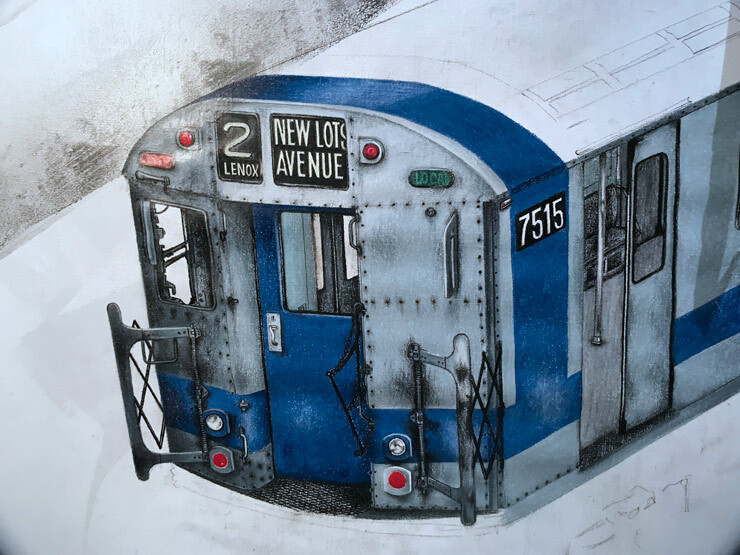 He speaks about the bonds forged among the graff writers in the early days; How they would exchange tips for tool making, techniques and hitting trains. It has the markings of a tight community. 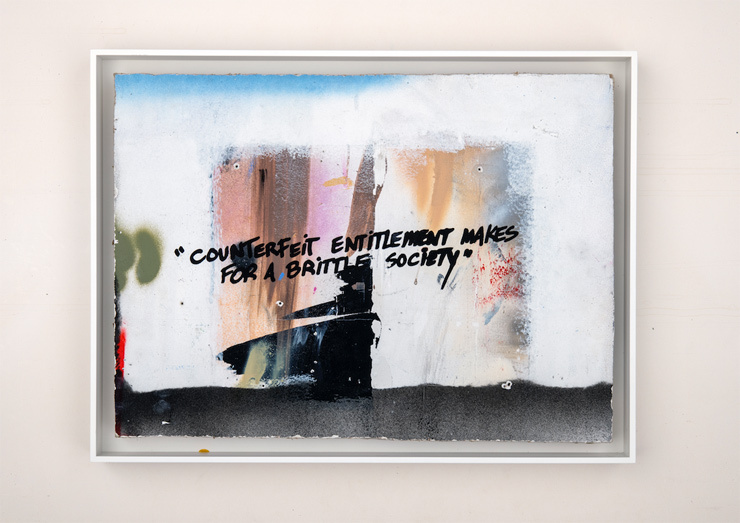 BSA: Four decades into your work as a self-made artist, one of your paintings for this exhibition is titled “Karma”. What was the genesis of this and what role does Karma play in your life as an artist? Lee Quiñones: There are several pieces in the show that have ignited the idea of karma. 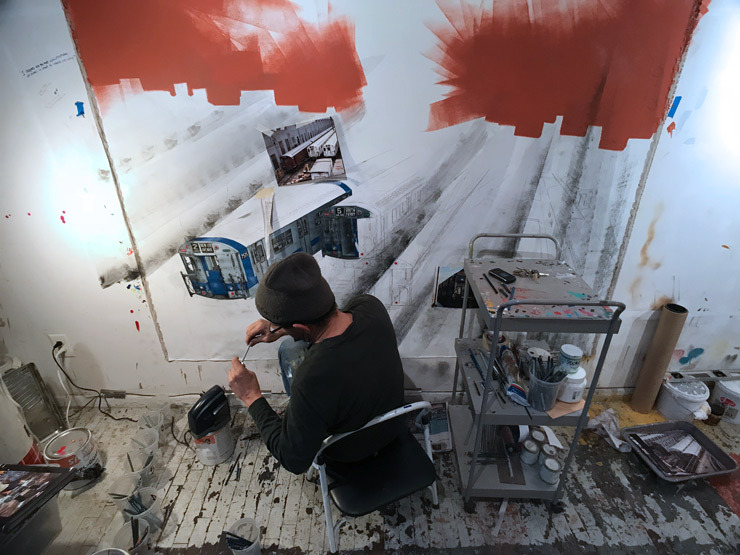 I spend a lot of time in my studio having sit-ins with my work whether there are already formed or in theory, so I have many passages of time that come to mind and usually one thing reflects on another or as I say, rhymes with each other. Life is fulfilling and revealing like that if you look hard enough. On that same note, I review life and humanity in a sarcastic manner in my head over time, and that in turn spills out onto my work or onto works that are specifically worthy of sarcasm. Lee Quiñones: I have over time studied people in challenging situations that hide certain emotions in the details and reveal eye candy for the rest of us that just simply look and not see. 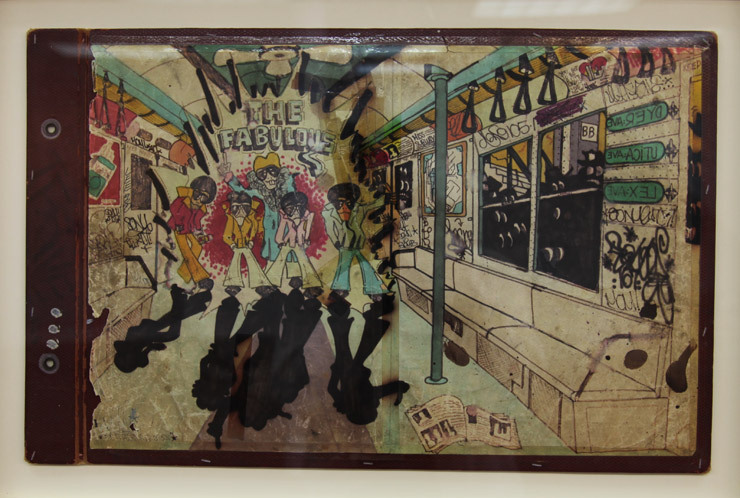 The study painting “9 lives” centralizes around the segregation that unfolded its ugly head during the late fifties when students of color were finally allowed to attend certain schools throughout the nation. I was especially driven to the 1957 incidence at the Little Rock Central High School in Arkansas where nine freshman students of color were to be escorted by police and or national guardsmen to their respective classes of study. One of the nine students, Elizabeth Eckford came early that day to school and subsequently endured a gauntlet of hate chants from her future fellow students led by a very angry and vocal Hazel Bryan. The photograph that captured that moment etched that dark time in the history books. What I found in making this piece of which it is a study to a larger one in progress is that their emotions of hate and courage were so prominent in their hands. The juxtaposition of a hand clutching a rolled up newspaper in a authoritarian way fueled by hate and fear against a hand clutching books of study showing steadfast and courage was irrefutable. BSA: In studio we touched on the topic of how graffiti and street artists like to talk about “community” but often we have observed that there’s little support among the artists for each other in practice. You mentioned how in the old days of train painting you guys really supported each other shared techniques and exchanged your new style discoveries. What changed? The air is thin in some places of success and artist have only artists to rely on as sound boards and for sound advise. That there is the oxygen needed to be authentic and poised for your moment when it comes rightfully so. What you do with that moment is embrace your hard work and to not be compelled to feel threatened by an associate. I keep my closes allies from back in the day on the front pages of my day planner and I’m always interviewing new souls. BSA: You are having your first solo exhibition in LA. What took you so long? I’d like to think that this is a prelude, my first shot across the bow of the left coast in what will be a gathering of works itching to spill out. 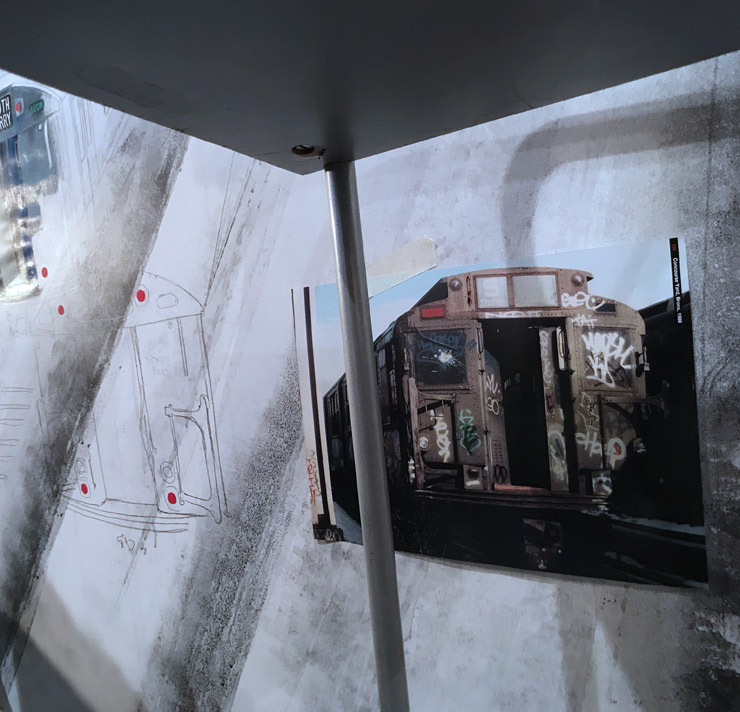 BSA: Most people are familiar with the path that NYC graffiti culture took in the 80s and 90s to Western and Eastern Europe – and you’ve had the opportunity to hang out with writers from around the world thanks to your pioneering work on trains. 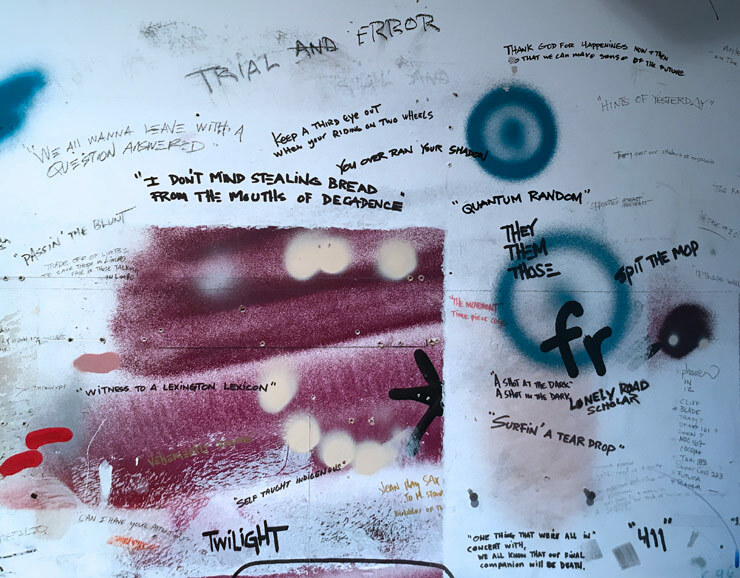 Would you say that there is a difference between the graffiti experience in NYC and in Europe? Lee Quiñones: Sure thing. I mean, while things are extremely close to you while they are developing, you can’t possibly see it clearly, so in essence, you need to remove yourself for an incubator period in order to focus more vividly and perhaps compare notes with your line of experiences. Europe has an extremely vast history in the arts throughout the ages. Empires have come and gone and in the end, we begin to understand them through the art that survives. America is not of age just yet. It has acne, still wrestles with its growing pains and is hesitant to show its proper ID at the velvet ropes, so this particular movement which had no reference to art history in the first place is just cresting it’s wave. 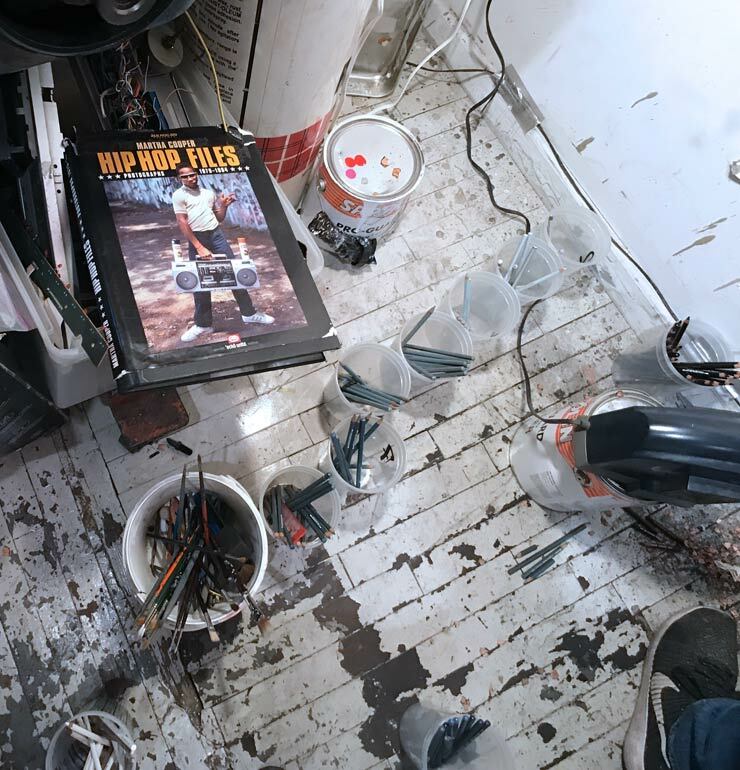 BSA: Not many artists can sustain a long career, especially true when it comes to graffiti writers. 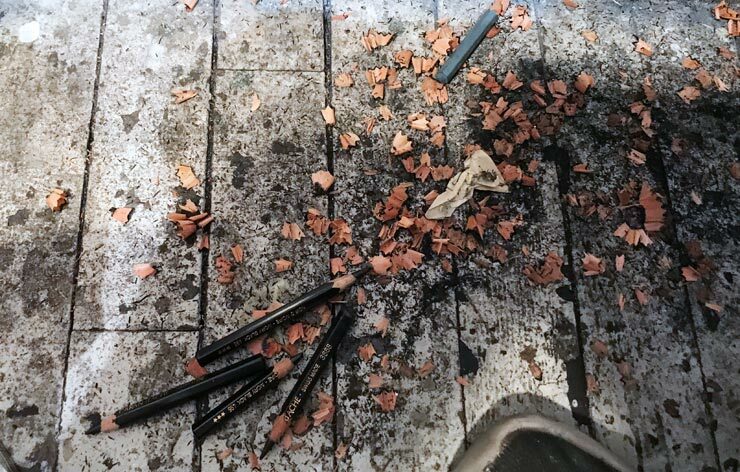 Challenging oneself to explore and take risks as an artist appears to be crucial to continuing to evolve creatively – particularly if you want to become professional. What’s your biggest challenge as an artist these days? 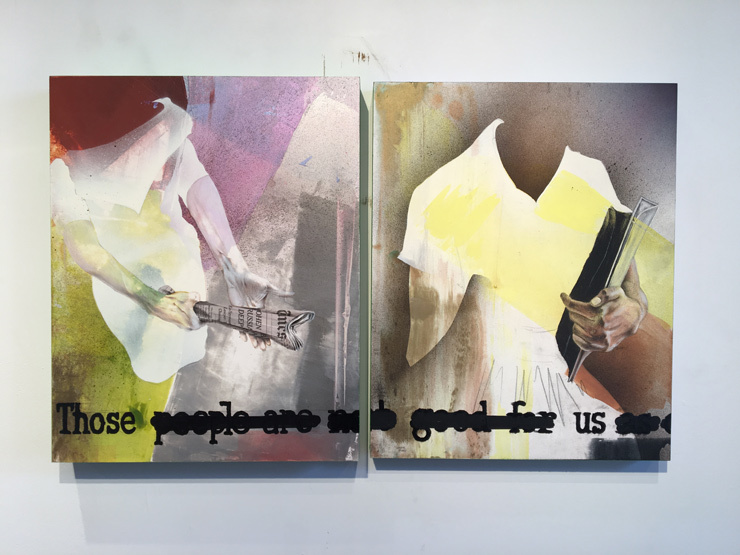 Lee Quiñones: Ushering people out of the context of nostalgia and looking at the current state of affairs in the works of today. I mean, the subject of the trains and all its glory is for me to bring out on occasion with a twist, not for people to theoretically box me into it. I turn pages because I don’t want to be defined on one page. Personally, my own challenges consists of navigating around my own self tripping wires. Some are booby-trapped and some are triggers for the lights at the end of the tunnel.